Complete our Commercial Floristry Course and you may like to continue on in one of our Advanced Design Courses. Come and join us for as many weeks as you would like, you may decide on 4, 6, or 8 weeks. Bring a friend along to enjoy your classes even more. Hobby – learning how to make beautiful gifts for Birthdays, or to give your friends/family for a Dinner table design or special occasion, become more confident handling flowers and learn all about them. Home Design -Techniques to arranging flowers in vases of all shapes and sizes, table designs in Oasis for all occasions and for the different places/positions in your home. Bouquets – to learn the techniques of making Bouquets, Open Sprays and Posies, modern design in groupings of varieties of flowers, different types of gift-wrapping afterwards. Introduction to Commercial Floristry – to see if this is the path you would like to take for the future. Hospital gift Design, Gifts sent to the Home, i.e. Table Design, Birthday Gift Design and baskets/boxes of flowers. 2 day Workshops priced @ $480 – 3 hours day 11 a.m. to 2 p.m. or 4 hours + lunchbreak @ $580. Phone the Academy to arrange suitable dates. 2 day Workshop Packages offer small private classes with one-to-one training, hands-on practical flower arranging and you will have your Teacher close by at all times to personally guide and assist you with your designs. There will be no more than 2-3 Students in your class. 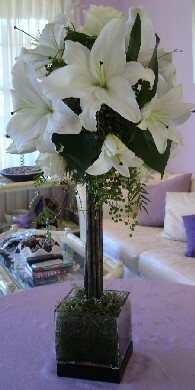 Contact us now to enrol in your choice of Florist 2 day Workshop Packages; you will be thrilled every moment you are here. You will be inspired with our perfect learning environment and enjoy absorbing knowledge and making new friends.